Williams Event Management (WEM) along with Motorcycling Australia (MA) has announced the venue for the 2013 Yamaha Australian ATV MX Championship. The two day event will be held from 7 - 8 September at the Coolum Pines Motocross Track in Queensland the week after the final round of the Australian Motocross Championships. 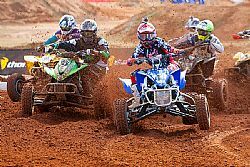 This will be the third round for the Pro Quads and will included a full program of all other ATV Championship classes. “We have been working on a venue for some time that would work for the ATV community." Kevin Williams from WEM explained. "We were looking at Warwick, but due to track licensing we have confirmed the Coolum track. "The Sunshine Coast Council has been a great supporter of the National Motocross Championship and their support of National Motocross made this a great option”, Williams added. Top Image: Round two and three of the 2013 Yamaha Australian ATV MX Championships will be held at Coolum.